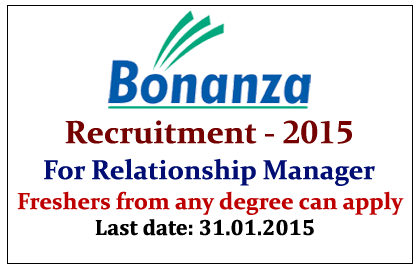 Bonanza has announced openings for the post of Relationship Manager and Senior Relationship Manager. Freshers with any degree can apply for this post before 31.01.2015. More details regarding this recruitment were mentioned below. Bonanza is a reputed financial sector company which operates in more than 560 cities in India which was established in 1994. Candidates will be selected on the basis of performance in the personal interview. Eligible candidates can apply by filling the online application which was given in the link below. Candidates should submit your details before 31.01.2015.